Businesses with a blog have over 400% more indexed pages than those without. Businesses that blog get 97% more inbound links than those that don’t. B2B businesses that blog get 67% more leads than those that don’t. Small businesses that blog get 126% more lead growth than those that don’t. But, if you’re bothering to read this, I’m probably preachin’ to the choir. ([tweet]For those of you who don’t speak Southern, that means, “You’re telling me something I already know, so stop talking like I’m a few sugars shy of a sweet tea.”[/tweet]) The question of whether to blog or not to blog has been asked and answered. 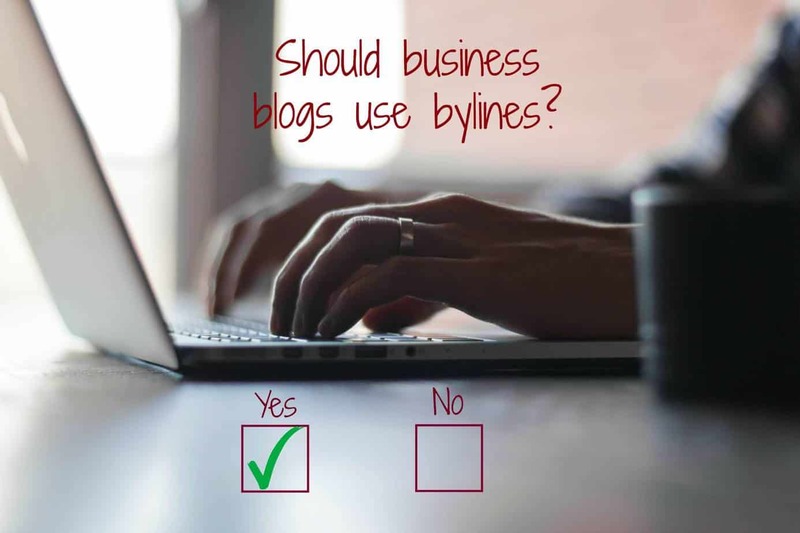 But there’s one question left: Should your blog posts include a writer byline? There are some situations — press releases, for example — when a writer byline is unnecessary or even inappropriate. When the content is a statement from the company as a whole — like when the White House issues a statement speaking as the face and voice of the United States — a writer byline is counterproductive. But blogging is more about thought leadership and branding, and there are strong arguments for attributing each post to a particular person — whether or not it’s the person who actually wrote it (as in the case of ghostwriting). A full [tweet]70% of consumers say that their purchasing decisions are influenced by blogs. [/tweet] And blogs affect those decisions more than other forms of social media, like Twitter and Instagram. True, some of those blog posts are written by other consumers rather than anyone associated with the company in question. But there’s no denying the influence of business blogging. And here’s the thing: People trust people, not faceless entities. In addition, [tweet]people trust blogs written by multiple writers more than those written by a single writer[/tweet]: 63% to 37%. It’s not a big leap to conclude that no attribution has some of the same drawbacks as single authorship. So if you’re using multiple writers (for the blog as a whole, not individual posts), highlighting that fact with writer bylines could boost your blog’s credibility. This is what I call borrowed glory. It’s like in high school, when hanging out with the cool kids made you look cool, too. The writer’s credentials spill over onto the content itself. Depending on the topic, this argument is strongest when the byline goes to an expert or leader within the company. But it can also be valuable when you outsource: Having Seth Godin’s byline on your agency’s marketing blog would imply that he thinks your agency is pretty hot stuff. And he should know, right? This comes into play when you outsource your content. For writers, bylines have a capital value. They boost the writer’s SERP, authority, and influence. They drive traffic to the writer’s website. They can be included in a portfolio and used in future marketing efforts. That’s why I offer a discount when I get a byline. So if you would get no tangible benefit from attributing the content to someone else (or nobody at all), consider offering the writer a byline in exchange for a lower fee. People pay more attention when they have some skin in the game. Whether you’re talking about a writer building a portfolio or a VP hoping to get that next promotion, most people unconsciously apply more effort when their name is attached. Writer bylines deliver built-in quality control. Whether you credit the actual writer or someone else (provided that’s part of the agreement,of course) depends on a number of factors, including your goals for the content. But, in most situations, there’s little to be gained and much to be lost from publishing blog content without a byline. You’re trying to build a connection, and connections happen between people, not entities. If you leave your content unattributed by default, it’s time to ask yourself if that’s really the best use of time and effort — for both you and your audience. PreviousThe Ghosts and the Unseen: Is Ghostwriting Ethical? NextFeel like you’ve missed the content boat? You haven’t, so hop on board right here.